Right now, thousands of birds are flocking to California, most of whom are escaping the freezing temperatures of their northern summer ranges. Some are coming to stay for the duration of the winter season but many will stay only for a brief, but much needed rest before continuing south, sometimes as far as Central and South America. How these birds know where they are going on their long migrations is still a mystery. Studies indicate that some birds take their navigational cues from the sun, moon and stars. Others have found that they use geographic landmarks like rivers and mountains, simply following the path of least resistance. And some might be using each of these approaches in combination. But, nobody knows for sure and maybe we never will. The Pacific Flyway (roughly illustrated above) is one of four flyways in North America used by migratory birds for their annual migrations. The San Francisco Bay, and the diversity of habitat surrounding the Bay, create one of the most important stopovers for migratory birds on this flyway. 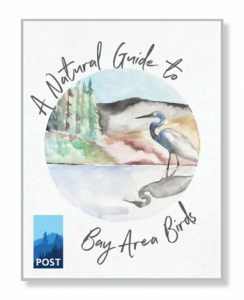 The San Francisco Bay is a critically important stopover for birds moving along the Pacific Flyway. As the largest freshwater estuary (tidal mouth of a large river) on the Pacific coasts of both North and South America, there is a cornucopia of habitat here that offers safe harbor for tired migrant birds. It’s an avian paradise, especially for those on the move. Freshwater from the southern Cascades, western Sierra Nevada and Coast Ranges converges here before colliding with the nutrient-rich waters of the Bay. It’s this abundance of both fresh and nutrient-rich salt water that feeds the wetlands of the Sacramento River Delta, the Bay’s vibrant marsh habitat and creates one of the most fertile habitats on earth. It’s no wonder why birds love it. But it’s not just the Bay and its wetlands that makes this region so attractive. 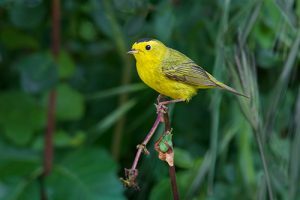 There’s a comfortable place here for almost every passing migratory bird thanks to the huge variety of climates and habitats in our area. The open marsh vegetation near the Bay (like Bair Island), oak savanna (like Arastradero), redwood forests (like Purisima Creek), chaparral (like Sierra Azul) and coastal prairie (like Wavecrest) offer a suite of habitat options for passing migrants. There is refuge here for almost every flight weary bird looking to rest and refuel.